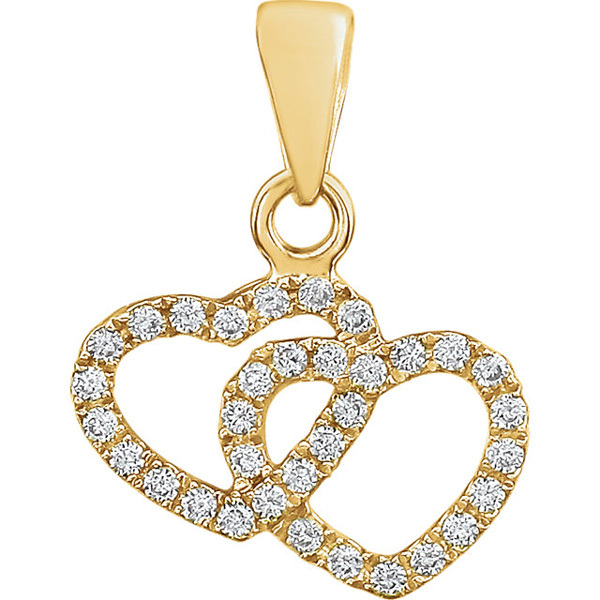 The soft, warm color of yellow gold sparkles with diamonds in this 14K yellow gold double heart diamond pendant from Apples of Gold Jewelry! Show her that your love is forever when you present this lovely interlocking heart pendant, featuring diamonds covering the surface of both hearts! Sized at 0.63 inch by just over 1/2 inch, this pendant has thirty-four diamonds that are rated H-I for color and I for clarity. The diamonds total 0.17 carats (1/6 carat total weight), and add so much extra personality to this gorgeous pendant, which will look lovely with a variety of chains of your choosing! 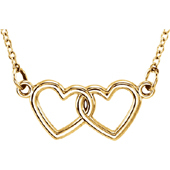 We guarantee our 14K Yellow Gold Double Heart Diamond Pendant to be high quality, authentic jewelry, as described above.